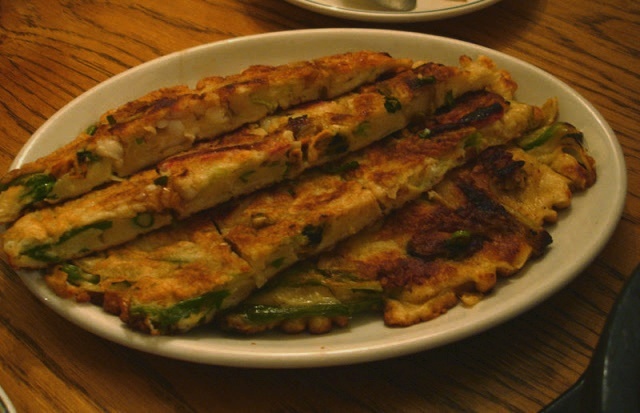 Bindaeddeok (Mung bean pancake) is a thick Korean style pancake made from ground mung beans cooked in a frying pan. Bindaeddeok is also a great source of nutrition for vegetarians. The ingredients may consist of either seafood, meat (usualy beef) or vegetables, depending on your preferences. Soak the green peas in water for at least 2 to 3 hours. Rub the mung beans between your hands to remove the skin and rinse again. Then take the mung beans of the water and put them in a food processor (2:1 pea to water ratio – add more water if you want a smoother mix) with water and grind to fairly fine paste. In an oiled, pour a ladle of paste to make 3-4 inches in diameter and cook until brown, turn only once. To serve, lightly dip the finished bindaeddeok into a soy sauce and vinegar mixture with some chili pepper flakes plus chopped green onions! Enjoy! Pancakes from mung beans? Excellent! I’m so pleased to have another meal idea from you..